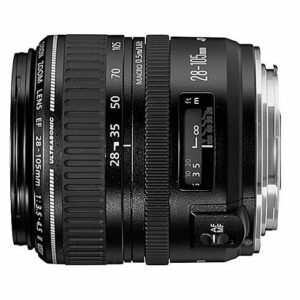 Lens Description: Retains the optical capability of the highly popular EF 28-105mm f/3.5-4.5 USM lens, with a refined exterior design. Includes ring-type USM drive for silent, high-speed autofocusing, plus full-time manual focusing. The compact design is a good match for the EOS A2/A2e or ELAN 7 series with built-in flash. An excellent zoom lens for everyday use.